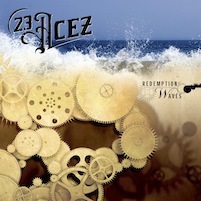 Belgian hard rockers 23 ACEZ bring their new album “Redemption Waves” in January 2015, and it’s a nice collection of melodic rocking tunes with good feel and attitude. “Loopholes” opens things up here, with a nice heavy main riff kicking things off into a rough vocal that reminds me of old school rock vocalists like Udo or even Biff Byford. The guy has a good sense of melodic control as well and uses it well on the chorus of the song. There’s a nice range of atmospheres within this one song, with nice heavy riffs meeting some softer sounds. “Alone” kicks off with a bass groove before hitting a synth laden guitar groove, and this track overall is quite a bit heavier, with some nice keyboard sounds too. The album continues on in this rocking fashion until hitting title track “Redemption Waves” which opens with a very different feel for previous tracks, building up with some nice slightly overdriven guitars and some nice piano moments before slamming into a really nice riff and some super high vocals. This one has a really nice sense of moving on throughout the track and really shows off what each member is capable of musically. The dynamics in the track are really cool too. There’s also “From The Moment”, which I thought was an awesome track with some interesting melodic moments and some very nice songwriting involved. The album ends on “Morning Sun” and its synth heavy intro which then evolves into some more riffage, and a great vocal delivery, closing the album in a very nice way. The production is pretty good, everything is nice and audible, even the bass guitar (a rarity in a lot of modern rock productions) and it all gels together well to form a nice heavy sound overall. “Redemption Waves” is a real solid rock album, with lots of good riffs and musicianship throughout, some great heavy grooves and really well delivered vocals; definitely worth checking out for true rock fans.